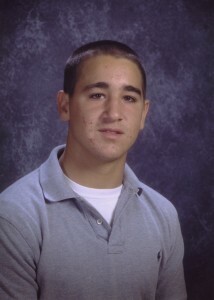 In February 2006, young Luke Abbate accepted a ride home from a fellow student following his high-school team practice. In a severe case of irresponsible and reckless teen-age driving, and over the objections of Luke and the other young passengers, the driver lost control of the car at nearly 90 miles-per-hour, spinning off a narrow road and landing in an embankment some seventy feet below. Luke suffered irreparable brain damage, and died in the hospital two days later – just four days before his sixteenth birthday. While in the hospital, the Abbate family made the difficult decision to permit the doctors to utilize Luke’s organs in a nationwide organ transplant program. Five recipients were almost immediately identified, including a young mother who was suffering with serious heart disease. Sharing an uncommon blood type, Luke’s heart was flown to the young woman’s hospital location across the country, resulting in a successful heart transplant, and saving her life. Following his brother’s death, Jon considered giving up his football career – but knew that doing so would not properly honor the younger brother who loved and idolized him. Upon his return to Wake Forest, Jon was given the approval of head coach Jim Grobe to change his number from his long-standing 40, to his brother’s number 5. And, in so doing, dedicated the new season to the memory of his brother. The Abbate family founded The Luke Abbate 5th Quarter Foundation for the purposes of educating young people nationwide to the dangers and life-altering consequences of irresponsible driving. A tradition began to evolve during the following Wake Forest games. In paying homage to Luke, Jon would signal his family sitting in the stands (Section 5) by holding up his hand with all 5 fingers outstretched. He did this at the end of the third quarter. Gradually, the rest of his team started to do the same. Within a couple of games, players from both teams, the fans in the stands, and those watching the games on television, would begin the final quarter by raising their hands with all 5 fingers outstretched in honor of Luke’s memory. The final quarter became known as Luke’s Quarter, the 5th Quarter, and this humble signal crystallized the entire team. And, although having lost their starting quarterback, starting running back, and starting defensive end to injuries at the beginning of the season, Wake Forest went on to complete their most successful season in school history, winning 11 games against 2 losses. Coach Grobe was selected the ACC’s Coach-Of-The-Year, and Jon performed brilliantly in the ACC Championship Game with fifteen solo tackles against powerhouse Georgia Tech. © 2019 Luke Abbate 5th Quarter Foundation. 501(c)3.